The My Claim app helps you manage your work injury claim information. 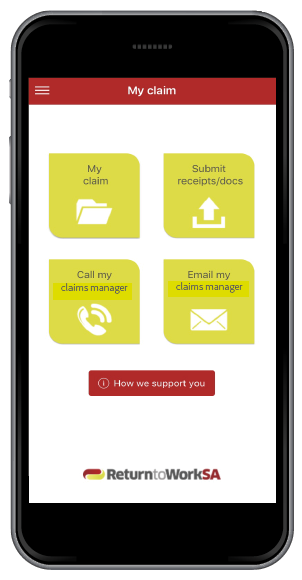 If you have a claim with ReturnToWorkSA, you can use this app to record details about your claim, quickly contact your claims manager, and send receipts for reimbursement and other documents to your Claims Agent. The My Claim app is available to download from the App Store and Google Play. Search for ‘rtwsa’ or 'my claim' to find the My Claim app and download the app onto your device. Once installed, simply enter your claim details and the app is ready to use. Note: iPhone users will need to ensure their mail app has been set up to allow documents to be sent to the Claims Agent. For more information about the My Claim app, speak to your Claims Manager. Download the My Claim app flyer.